It’s true: “Avengers: Age of Ultron” isn’t quite as fresh, funny, and delightful as the first one. It misses the appeal of seeing all these superheroes fighting together for the first time. Ultron, while a competent baddie, isn’t quite as charming a villain as Loki. After two features that at least partly broke with the regular superhero movie formula (“Captain America: The Winter Soldier” and “Guardians of the Galaxy”), this again is far more familiar – and ordinary – territory. And the nth destruction of a city during the showdown does start to feel a little old. However, all of that doesn’t change the fact that it’s still highly entertaining. If there’s one more problem that I haven’t discussed above, it’s that the first action sequence is also by far the best one. Everything that comes afterwards may have higher stakes and more destruction and spectacle, but there’s an energy, a self-assuredness and a playfulness to the first action scene that really made it stand out, and that unfortunately the movie in my opinion never quite reached again. It was very thrilling and exciting, and also extremely well shot, with many seemingly single-take shots like the one during the fight against the alien army in the first “Avengers”-movie, where the camera went from one Avenger to another. The later action scenes are nice, too, and what Joss Whedon does really well is including these short moments – be it a gag or a short character scene – that really stand out and that break down the massive action scenes into smaller parts that are more easily digestible. And those small moments really work well. It doesn’t completely prevent the bigger, later action scenes to feel a little bit like a jumbled mess, though. Thus, the more stripped down first action scene was by far my favorite of the movie. Other than that, it was mostly the more quiet, personal moments that worked really well for me. I especially liked the revelation of Hawkeye’s secret life, as well as the scenes between Romanoff and Banner/the Hulk. The interactions between the Avengers were great, too. It’s obvious that they grew into a real team by now, and it shows especially during the party scene at the beginning. I also like that this time, the threat doesn’t come from outside, but is actually self-made, if you will. Tony Stark still hasn’t quite overcome the events of the first movie, and when Scarlet Witch catches him, she further enhances his fears. And ultimately, it’s exactly this fear that causes everything that happens afterwards. I also loved the humor that was present throughout the film. I’m pretty sure that the further Avengers-adventures are in good hands with the Russo brothers, but I’m not so sure if we’ll get quite the same – and as much – humor from them, which is something that elevated the predecessor, and is also present again here. I’m not necessarily what you’d call a Whedonite, but I love the quirkiness that he brings into the mix, and “Age of Ultron” definitely benefits from that. As you’d expect from such a movie, the special effects are flawless. Brian Tyler and Danny Elfman also did a good job scoring the movie. I was especially glad to hear that (contrary to Hans Zimmers work for “The Amazing Spider-Man 2”) they used Alan Silvestri’s Avengers-theme again – even through there would still be a little room for improvement when it comes to the individual themes. I also liked the new characters. Ultron might be no Loki, but his biting sense of humor at least partly makes up for that. The twins are a great addition to the Marvel Universe; I especially loved Scarlet Witch, her powers, and how they were shown in the movie. And I loved that even at the end, you didn’t really quite know what to make of the Vision. Finally, there were a couple of touching scenes in between all the spectacle that really hit home with me. 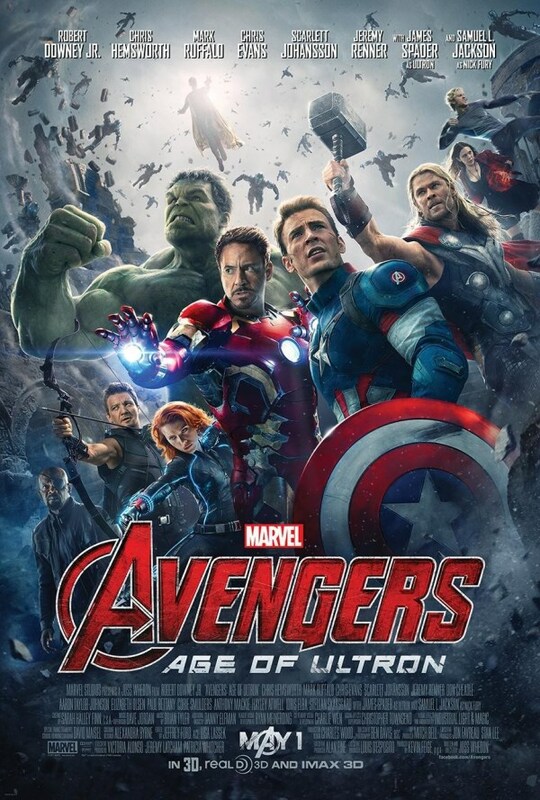 Overall, “Avengers: Age of Ultron” is a fun, nice superhero movie that might not quite reach the same heights as its predecessor, but that’s nevertheless a really good, entertaining film in its own right. This entry was posted in cinema 2015, movie reviews, new releases and tagged Aaron-Taylor Johnson, action, Anthony Mackie, Avengers, Chris Evans, Chris Hemsworth, Cobie Smulders, comic book movie, Don Cheadle, Elizabeth Olsen, imax, James Spader, Jeremy Renner, Joss Whedon, Mark Ruffalo, Marvel, Paul Bettany, Robert Downey Jr., Samuel L. Jackson, Scarlett Johansson. Bookmark the permalink.